Seki, Japan has been the center of Japanese cutlery production since the middle of the 13th century. It was a natural choice because of it's rich resources of iron sand and charcoal and it's proximity to water and all important elements in the crafting of fine cutlery. The techniques and skills of the ancient swordsmiths have been passed down　for centuries and continue to develop and progress with modern technology. 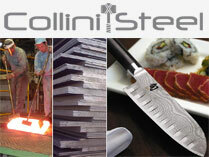 Seki City remains the vibrant hub of Japanese cutlery manufacture. MCUSTA knives are made in Seki City, Japan and are the pinnacle of this synthesis between traditional Japanese craftsmanship and modern cutting edge technology. The MCUSTA design team uses the 3D.CAM system to design new models and create prototypes. Each knife design is then meticulously inspected and then field tested. At this point the finest materials are chosen for durability, function and beauty. MCUSTA does not use the conventional method of die stamping their blades like most mass produced knives. Components are laser cut and C&C machined to assure the best possible precision fit. This is an important step in the production of a superior blade. Each knife is then hand assembled and hand finished and inspected by MCUSTA's team of craftsmen. MCUSTA knives are among the finest production knives made anywhere in the world!